Ironwear Wrist Bands™ are a fun way to show you train with Ironwear™ professional equipment. Ironwear Wrist Band’s™ unique patented design includes a soft integrated snap post system that makes it easy to take on and off. 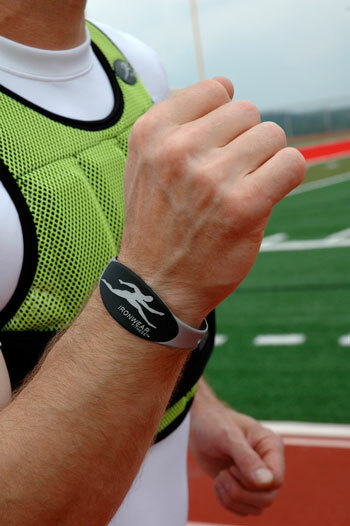 Seven snap posts and holes allow the band to adjust to fit almost any wrist size. The bands can also be cut down easily with scissors to fit even the smallest wrist. Ironwear Wrist Bands™ are safer and more comfortable than silicone bands. They are ultra thin and flexible and are designed to not interfere with your movements. Unlike watch bands the Ironwear Wrist Band’s™ are made of durable soft rubber and can release without breaking if they are pulled hard. Ironwear Wrist Band’s™ colors are solid rubber and will not wear off like painted or printed wristbands. The band is solid metallic silver with a black oval surrounding Ironwear’s™ leaping man logo. Ironwear Wrist Band’s™ are a great tool for motivating students. Trainers and their trainees wear them to show they train with the best professional equipment. Others see their peers with the bands and want to earn one.